This is an original MUTOSCOPE arcade card from the 1940’s. 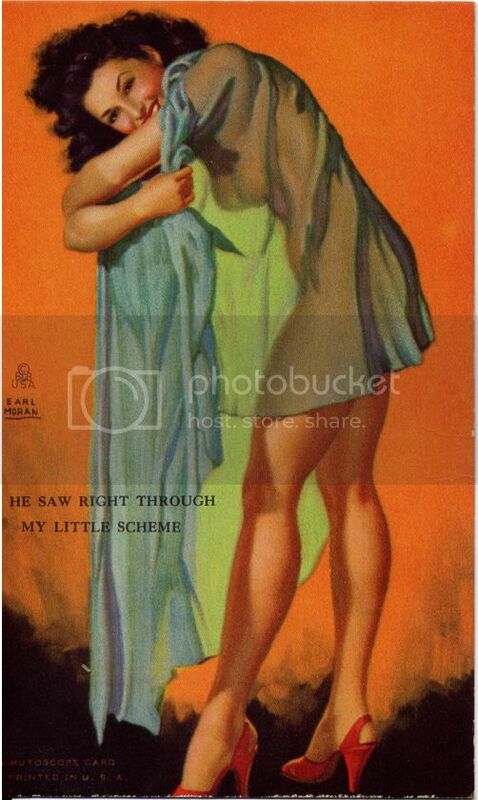 Master pin-up artist Earl Moran did the art titled “HE SAW RIGHT THROUGH MY LITTLE SCHEME”. The image is lithographed on heavy card stock and measures 5 1/4″ by 3 1/4″. This card is in Very Fine+ condition. Quality cheesecake from when the pin-up was in its’ heyday. Categories: ART, PRINTS & PORTFOLIOS, PAPER PRODUCTS, MISC, TRADING CARDS. Tags: art, cheesecake, Earl Moran, illustration, mutoscope, pin up. Be the first to review “EARL MORAN CHEESECAKE PIN-UP Mutoscope Card (1940’s) He Saw Right Through My Little Scheme” Click here to cancel reply.